Hello! I know I haven't posted in a few days, but I've been working on several projects! My 4 year old's teacher asked if I could make a bunch of things for their upcoming Mother's Day tea that they will be having in a couple of weeks so I had 30 paper tea cups with coordinating picture frame cards to bust out. I'm ALMOST done thank goodness! Also, I worked on some favor boxes this weekend for a ladies tea that we are having at our church on Saturday. My bible study group decided to host a table and of course I volunteered to do the favors:) I will share that later in the week. 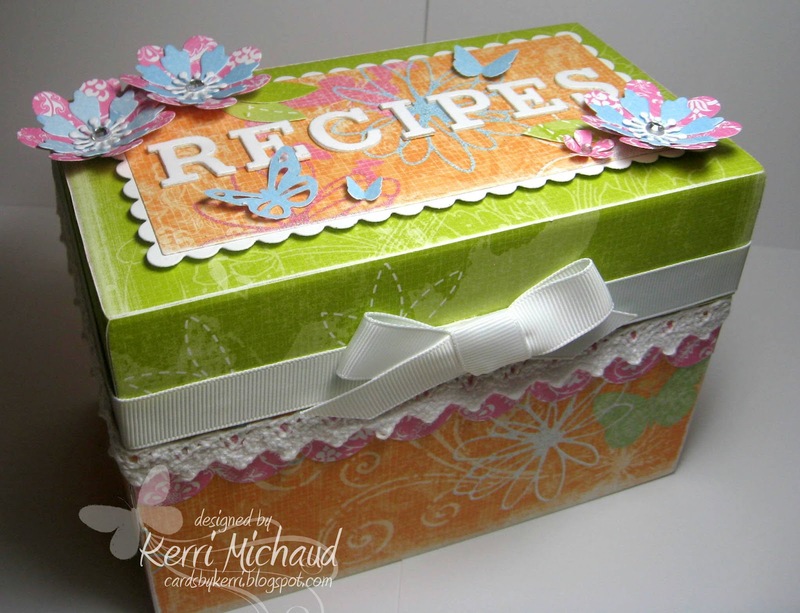 Then, I've been working on a little gift set for a friend of mine's birthday, and last but not least, I altered this wooden recipe box for another friend~WHEW! I bought the box at Joanns, and decoupaged it with some old Little Yellow Bicycle Delightful dp. 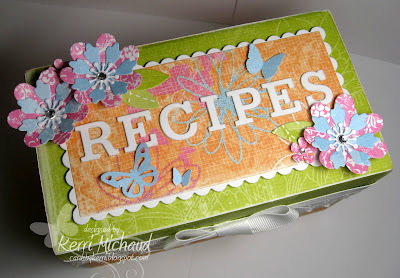 I added the letters using PTI alphabet dies, and the flowers were made with the MFT Die-namics Prima Donna Petals. I also added some Martha Stewart punched butterflies and rhinestones. The rectangle was cut with Long Rectangle Nestabilities. 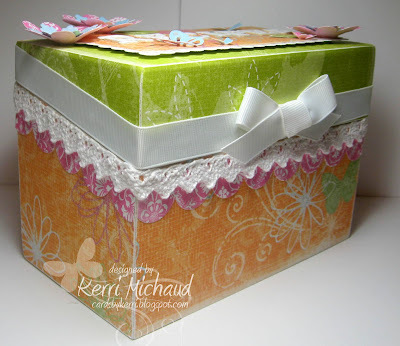 I added some ribbon, lace, and a scalloped border cut with my MFT Die-namics medium scallop border die. Sorry for the poor pictures. I took them very quickly early in the morning before having to take it to her. She wanted to give it to a friend for her bridal shower and the theme was recipes-CUTE! I'll be back later in the week with all of the other projects mentioned above! Thank you so much for stopping by and enjoy the rest of your Monday! What a beautiful box Kerri, wonderful colours!